When most people say that they work is piling up, they don't mean it literally. Most years after the tour in December I have taken a break for the rest of the month and I get back to work refreshed in January. This year I didn't take that break since my work time is so scarce anyway. I started throwing again and I haven't stopped. I had lots on my to-do list and more keep coming up. 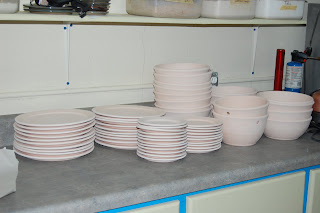 Also the transition from throwing to glazing and firing takes some time for me both mentally and actually. 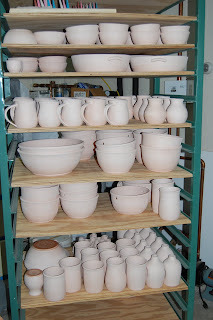 And there are kiln issues and glaze tests that I've been putting off. It's much easier to just keep throwing. After two months of that, the pots are piling up! And of course there's been knitting! There seems to be another baby boom this spring and again in September, so I always have a pair of baby socks in progress. This is a pair I've been working on since last fall. They were my travel and tv knitting, so they've been slow going. 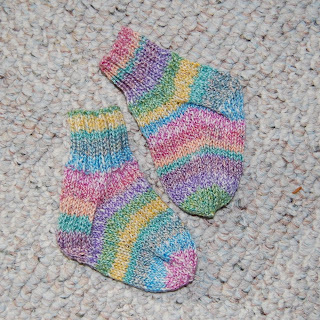 The pattern is Jaywalker and the yarn is Lorna's Laces in the Grumperina colorway. 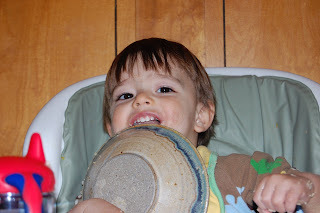 And of course I can't quit without a kid picture! We spent a couple of days in Charlotte visiting the Grandparents. It was lots of fun, but none of us got enough sleep since one of us decided to get up at 5:30 am. Beautiful stuff! Please show some of it once it's glazed. 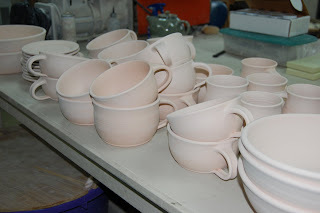 Love the professional quality of your work, even unglazed. And I guess we're seeing some glazed in the kid photo! He's still SO CUTE. I like how your Jaywalkers came out. Can you believe I still haven't knit that pattern? that is a lot of work. a lot.